The summer was far behind us. 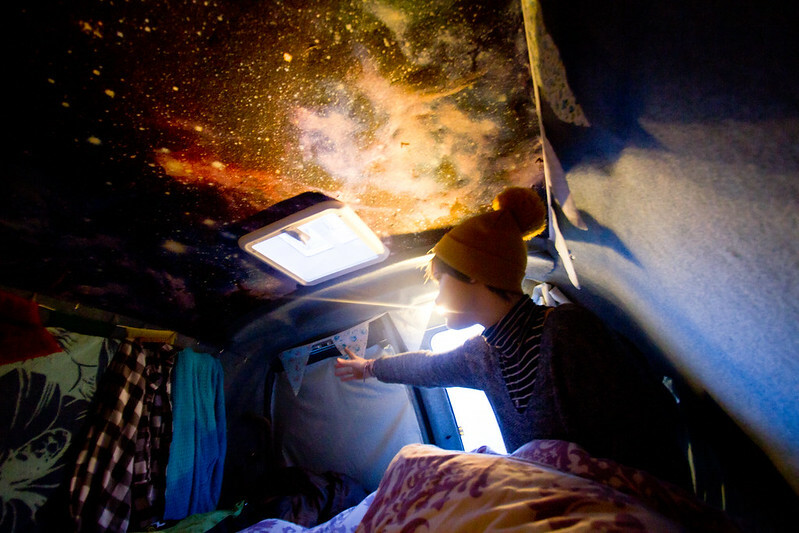 Winter was rapidly approaching, the days were growing shorter, the temperatures dropping, and numerous gales and rainstorms were making the van conversion, with it’s hours of time spent outdoors, feel a little more daunting/laborious. 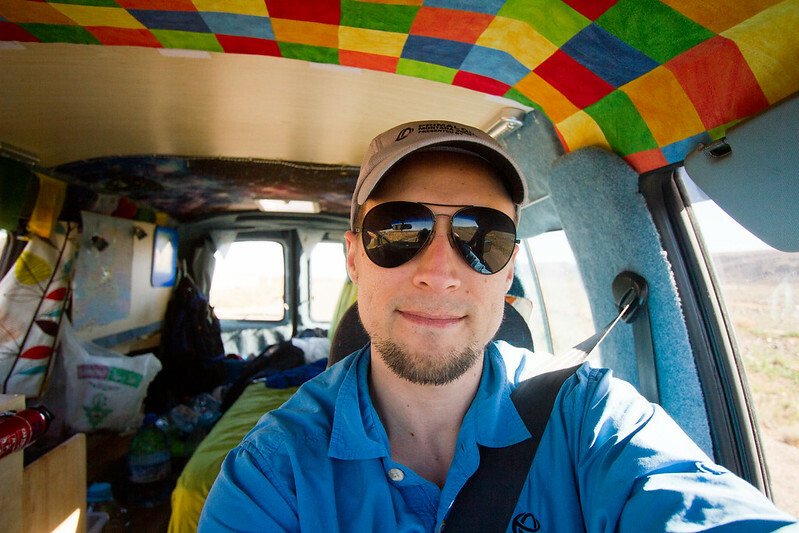 We were ready to finish our van conversion process, and begin our trip around Europe. Over the course of the past few months, we’d purchased and imported our Hyundai H200, stripped it our, insulated, repaired, carpeted, built furniture, and now all that was left to do was the installation of a leisure battery, which would allow us to use our kettle, toaster and cooler whilst the car was not running, together with the building of some sort of sink system, and the finishing up of our decorating, ready for a test trip we’d been planning for December, when we’d drive up into the Scottish Highlands. 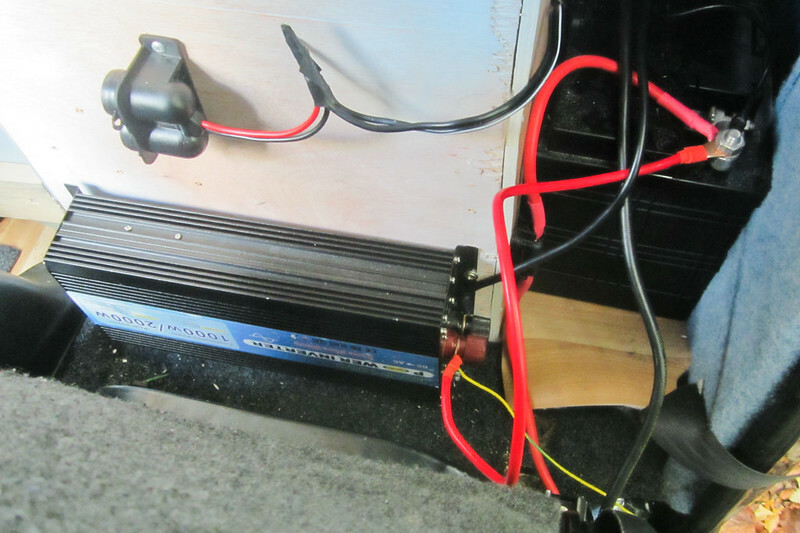 We began the final stage of our van conversion by installing our leisure battery and inverter, which we wired to the engine of the car. 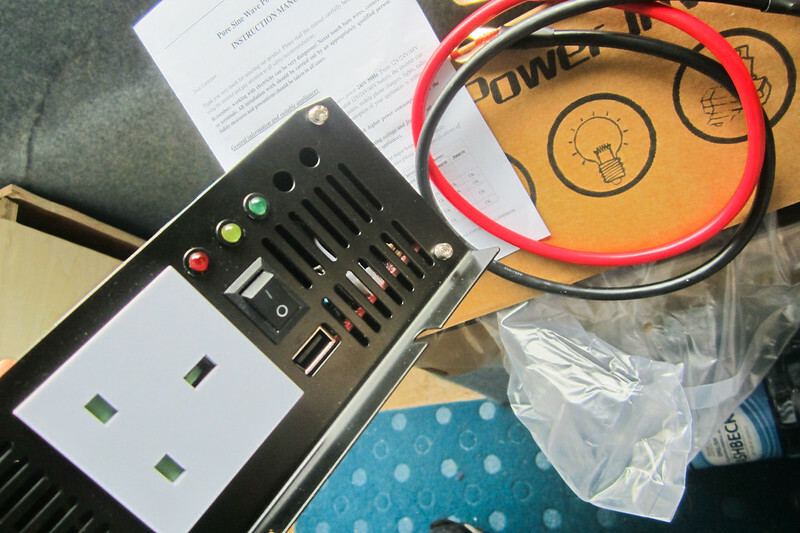 We’ll write an in-depth post about just how you go about doing something like this, we enlisted the help of my brother to install the electrics system safely. 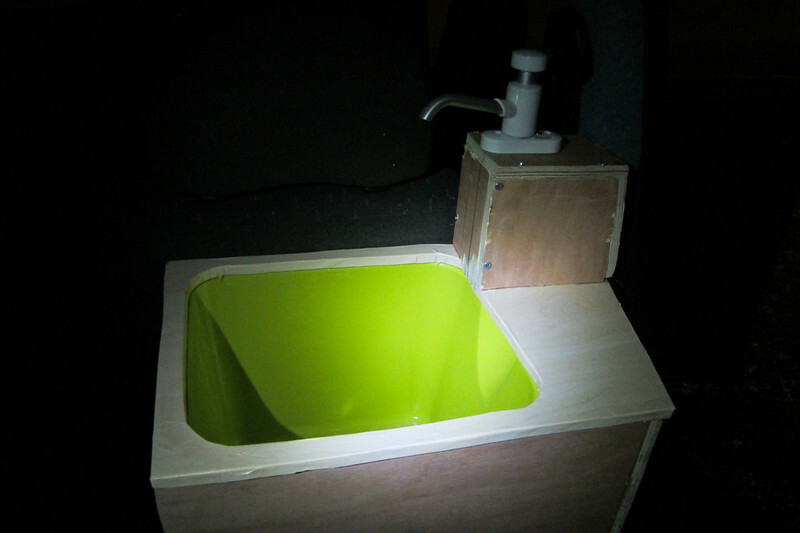 We then started work on a sink system. 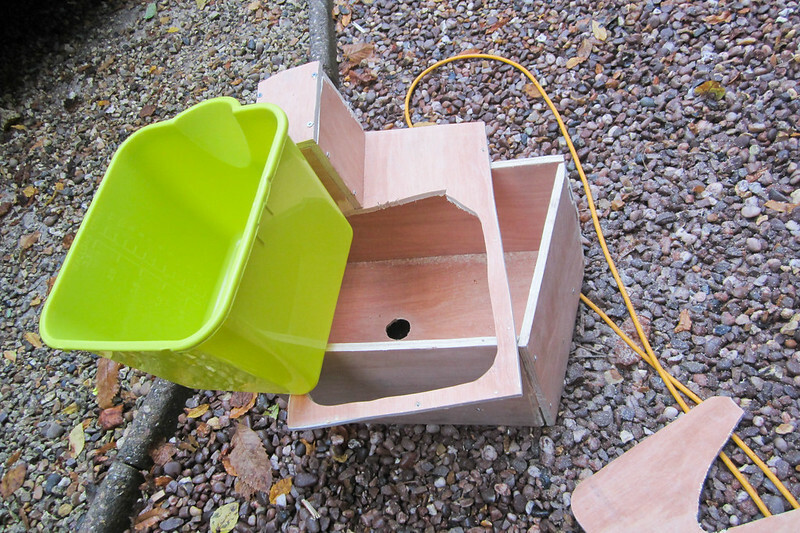 Mike crafted two wooden boxes, one of which was just large enough to store two plastic water tanks, one for grey water, and one for drinking water. We then went out and bought a plastic mop-bucket, a whale water pump, and a collection of plumbing tubes and plugs. We drilled a plughole into our plastic bucket, and installed a tube running from the plughole, into the dirty water tank. We also installed a tube running from our clean water tank to the whale pump. These tubes are removable – they allow us to pull out our dirty water tank to clean, and also refill our 20 litre clean water tank. 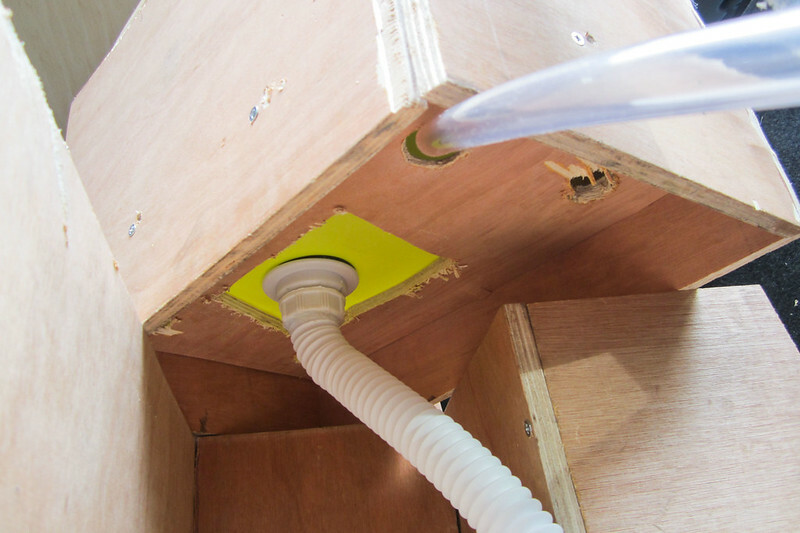 We covered the wooden framing of the sink with a waterproof sticky plastic. 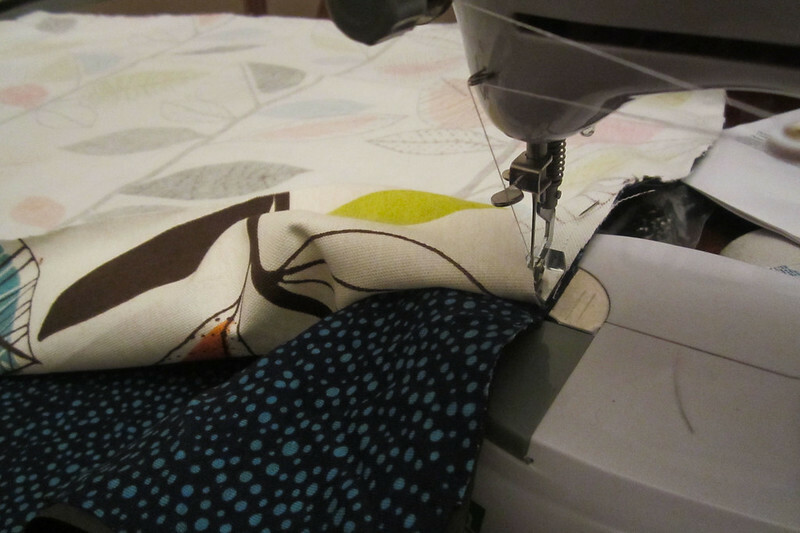 Meanwhile, with Mike busy with the creation of our sink-system, I was handsewing a blackout partition, which we would velcro to the ceiling at night time, to separate our living space from the two front seats, along with four blackout curtains. 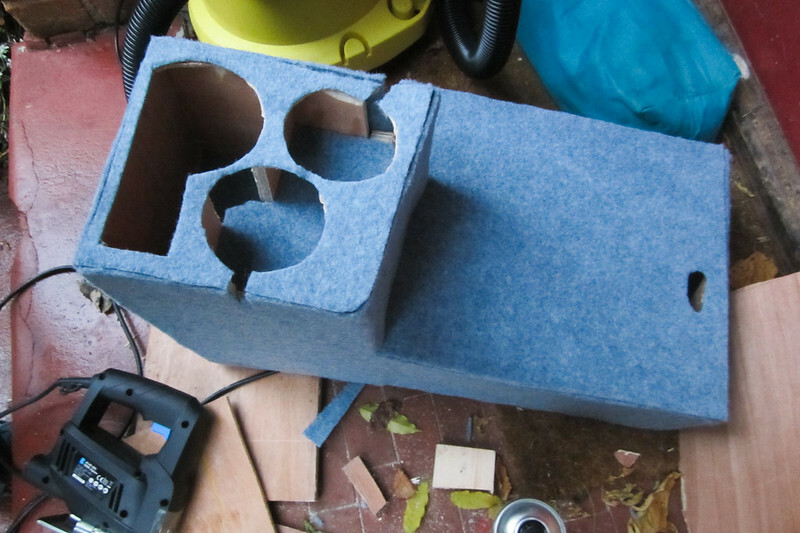 We chose two blue materials, one darker for the outside looking into the van, and one lighter for the inside of the van, and sewed these together with cut out pieces of blackout blind between the two. 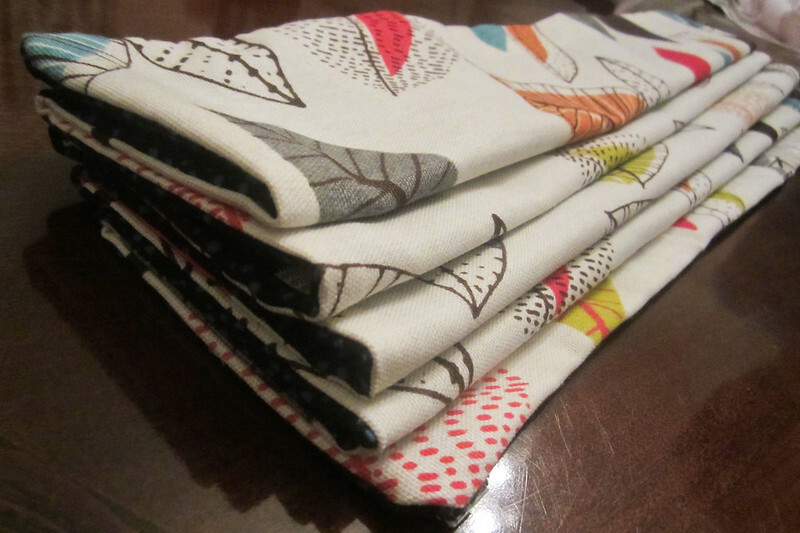 We hung up our curtains with plastic wire and a series of metal rings, and glued velcro to the curtains to ensure no light would escape. 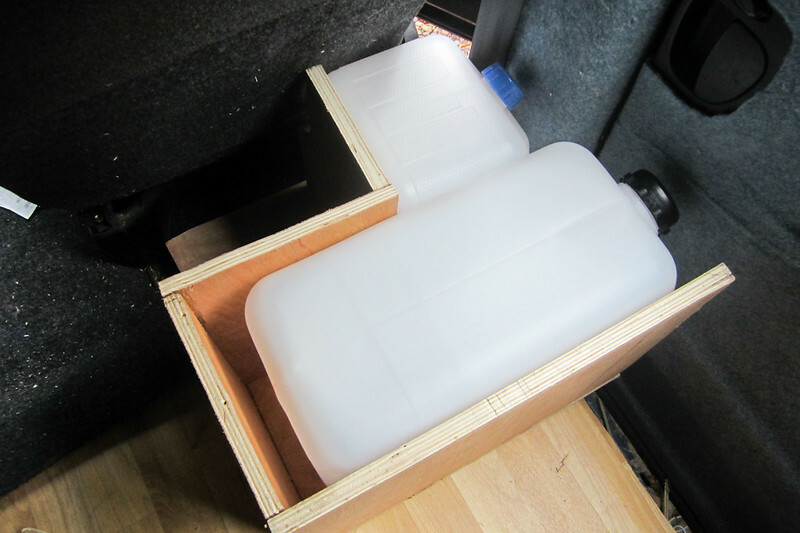 Mike also installed a cup holder in the front of the van, and a number of ikea plastic storage boxes anywhere we could fit them, to include the back doors and the space between the two front seats. 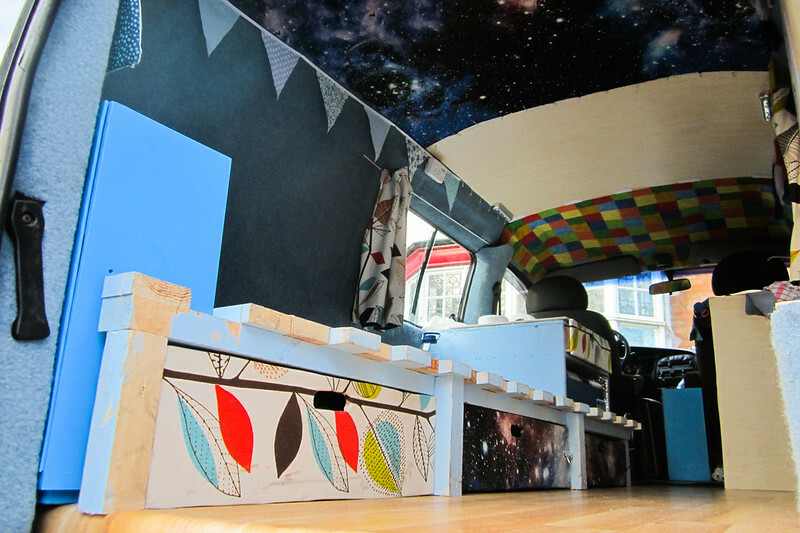 With all of the necessary structural elements of the van now in place, we could begin finishing up with our decorating! 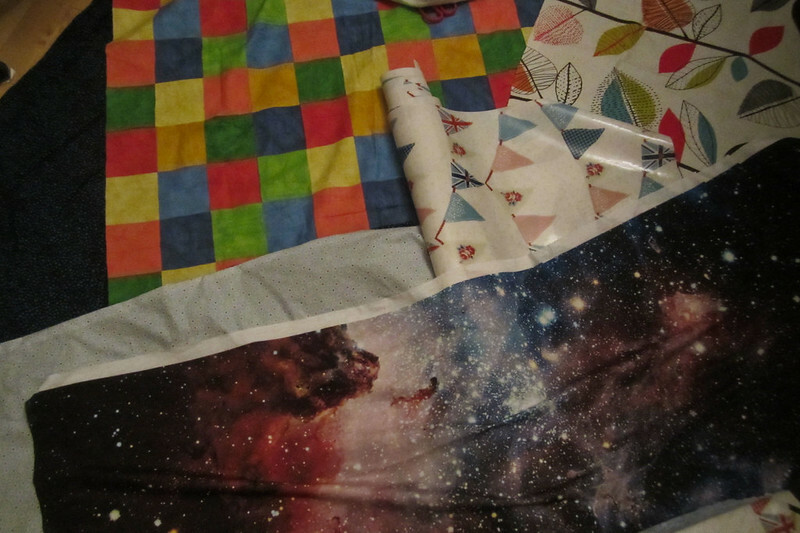 We glued patchwork material to the roof, installed battery-operated fairylights, attached hooks to our drawers to stop them from flying around whilst we were on the road, and we hung up flags. We glued a tile to our kitchen counter and stuck maps to the wall. Our van, unbelievably, was finally, after months of challenging yet hugely enjoyable work, ready for a test drive… and where better than a blustery, snow-covered Scotland! 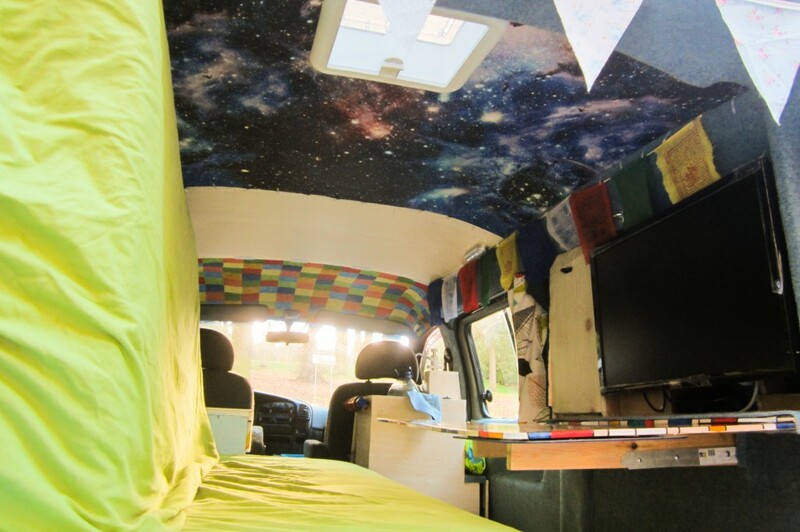 We’d finished converting our van, and were ready to move into our new home! 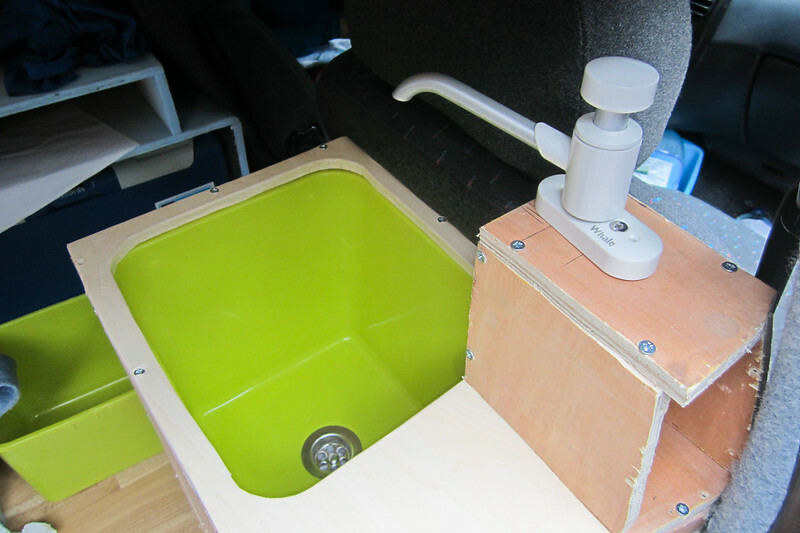 Check out our huge flickr album of our van conversion here. What a fantastic idea for a sink. Boy, I’m gonna miss the sequels … guess it must stop somewhere! I’m surprised at your choice of vehicle. It’s a popular model here in the Philippines but it’s known for a few issues. 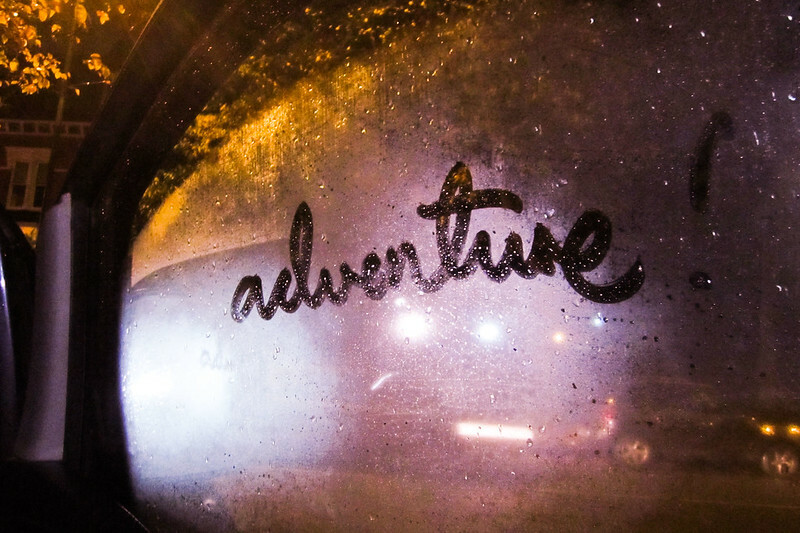 Deeply envious of your adventure. Hyundai should fund you two.